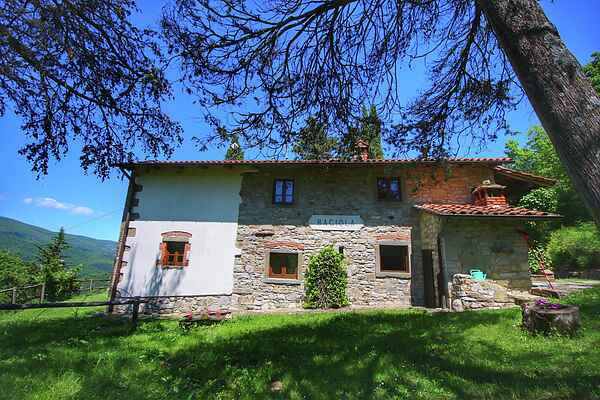 Agriturismo Nonno Raoul is situated right in the middle of the Casentino valley woodlands. The agriturismo is part of an agricultural farm set in 350-hectare grounds with a small swimming lake at 2 km distance from the house. The lake is located in a magical spot and there's also a picnic table and a barbecue. The natural surroundings, a crowing rooster, the sounds of nature, the dirt roads and the stunning sunrises all contribute to the real countryside feeling of this agriturismo. Agriturismo Nonno Raoul consists of 2 apartments with typical Tuscan style interiors featuring terracotta tiling and traditional wooden rafters. The spacious garden is a perfect place to enjoy the tranquility and the surroundings of this place. The agriturismo makes an ideal base for cultural trips to Florence, Arezzo, and other Tuscan towns. The gorgeous views across the valley, the ancient woodlands and the surrounding villages are beautiful and you'll love the Tuscan countryside with its olive trees, vineyards, chestnut trees and cypresses. The closest town is Ortignano Raggiolo, which is about 3 km away.